If you’re looking for some fantastic guitar-related action next weekend (and even if you weren’t) then look no further than Melbourne. Michael MacManus and Evan Hopkins, founders of the Melbourne Guitar Foundation, have been working their socks off again to bring us the inaugural Melbourne International Guitar Festival and Competition featuring several world class recitals from Saturday 19th September to Sunday 20th September at Melba Hall, the University of Melbourne, Royal Parade, Parkville. Festival passes are $50/$40 full/concession. The weekend will feature several concerts featuring world class artists: Vladimir Gorbach (2011 GFA International concert artist winner and recently appointed head of guitar at the Sydney Conservatorium), Alex Tsiboulski (winner of 7 international music competitions, ARIA nominated and NAXOS recording artist) and the Melbourne Guitar Quartet (the string quartet for guitars! Part of the Melbourne Recital Centre 2015 Local Heroes program) with support from the Victorian Guitar Orchestra (featuring yours truly!). The competition, which has drawn 50 entrants from all states of Australia and New Zealand, includes Beginner, Intermediate, Advanced and Open categories, will be held between the concerts. 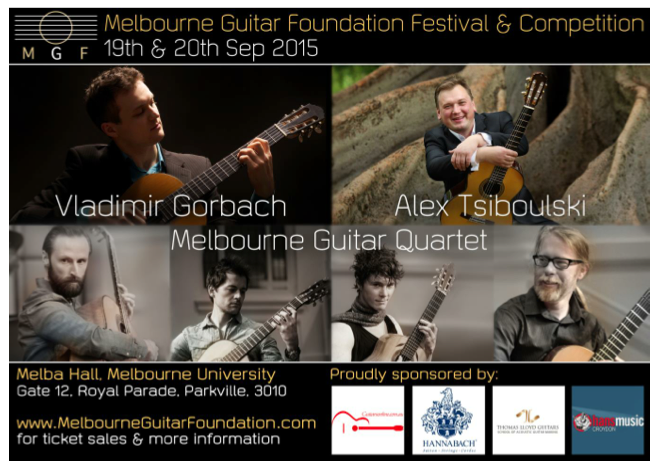 Young Melbourne Entrepreneurs and current classical guitar M.Mus(Performance) students from the Melbourne Conservatorium, Michael MacManus and Evan Hopkins, banded together in late 2014 to establish the Melbourne Guitar Foundation. Their mission is promote and cultivate the classical guitar in Australia. With a vision of an engaged local community of guitarists contributing towards a culture of learning, support and sharing of ideas to create the best musical and artistic environment in Australia. After a highly successful international concert season in 2015, featuring international Swedish star Johannes Möller, Guitar Trek member Minh Le Hoang, European-based ensemble Duo Amythis, and a $1000 student scholarship program, the MGF is gearing up for their biggest event of the year. This festival essentially follows on from the work I did in 2013 when I organised and ran a large national guitar competition through the Classical Guitar Society of Victoria. Unfortunately CGSV stopped running this competition last year, so Evan Hopkins (who co- runs the MGF with me) and I are picking up the reigns to continue this tradition, and add to it by including a festival component! We are very grateful for the support of the CGSV who are kindly donating the $1000 first prize for our competition, and our other sponsors, GuitarsOnline, Hannabach Strings, Thomas Lloyd Guitars, Hans Music Spot and CutCommon magazine. This festival was created as a way for us to bring together the close guitar family throughout Australia and a chance to promote the classical instrument to audiences in Melbourne. It also gives a platform for our up-and-coming musicians to showcase their talents in front of a receptive audience. The festival component includes several fantastic concerts of the highest calibre and we are thrilled to see some competitor entrants flying over from New Zealand to be involved! I personally reckon Michael and Evan are doing a bloody good job in their mission so far! Keep it up guys and really looking forward to the Festival! Sept 19: 1:30pm – Lunch time recital by the Melbourne Guitar Quartet with support from the Victorian Guitar Orchestra and Melbourne Conservatorium Guitar Ensemble. Both evening recitals are catered during intermission with free wine, beer, chocolate and cheese platters available. The festival will be held at the historic Melba Hall, which recently celebrated its 100th anniversary. Named after the great Dame Nellie Melba, who laid the foundation stone, this Heritage Listed Building continues to breathe new life into the Melbourne music scene. Internationally acclaimed guitarist Vladimir Gorbach has captivated audiences across Europe, Australia the United States and his native country of Russia. His international success began when he was accepted into the Yehudi Menuhin Foundation “Live Music Now” outreach program. He then went on to win many international guitar competitions and prizes in Spain, Italy, Germany, Portugal, Greece and most recently at the 2011 Guitar Foundation of America earning him a full season concert tour throughout North America, including at Debut Carnegie Hall, NY; Canada, Mexico, South America, and China, in addition to a publication with Mel Bay and a recording for Naxos label distributed worldwide. In 2013 Vladimir took on his new duties to lead the guitar program at the California State University, Fullerton, in addition to his new role as the first International Artist Fellow in Music at the University of Southern California, Thornton School of Music to pursue his Doctoral of Musical Arts (DMA) studies. (USC’s most elite graduate fellowship, nick-named as the “Rhodes Scholarship” for the Arts, which is granted annually to only one fellow in each of six arts schools at USC). He has performed in recital and as soloist with chamber ensembles of Orchestra de Las Beiras, the Orchestra de Aveiro (Portugal), the Russian Academic Chamber Orchestra Musica Viva, the Symphony Orchestra of New Russia, and Junge Philharmonie Köln , as well as appearances at the Moscow Philharmonic Concert Series, Koblenz International Guitar Festival (Germany), Guitar Art Festival Belgrade (Serbia), Vienna Guitar Forum (Austria), Nantes Summer Guitar Academy (France), Vondelpark Festival (The Netherlands), and Sydney Crows Nest Concert Cycle (Australia), in addition to giving master-classes at numerous festivals. This year Vladimir started his appointment at the University of Sydney, Sydney Conservatorium of Music as the chair of the guitar studies. The guitar family is to the guitar world what the string quartet is to the string world. Repertoire creation for this trail blazing genre is central to the Melbourne Guitar Quartet’s mission, and is an exciting development in the guitar – playing scene.It will pave the way for future generations of classical guitar quartets in Australia and internationally. Guitar performance is set to transform with MGQ at the helm. Join them on their ground – breaking journey of creating new repertoire for guitar quartet. Ukrainian-born guitarist Alex Tsiboulski began playing the guitar at age 12, shortly after moving to Australia. He is winner of seven international competitions, including the 2000 Australian Guitar Competition, 2003 Gisborne Instrumental Music Competition (NZ) and the 2006 Tokyo International Guitar Competition. His second solo release, Australian Guitar Music on Naxos was nominated for Best Classical Album at the 2010 ARIA awards. He has performed widely as a soloist as well as a chamber musician. Together with tenor Robert Macfarlane, he is a part of Duo Trystero, a voice and guitar ensemble dedicated to recently composed works of literary and musical significance. 2015 will see a release of a new solo recording featuring striking new arrangements of three of J.S. Bach’s Cello Suites. Conducted by Ben Dix (member of the Melbourne Guitar Quartet) this orchestra sees a diverse mix of guitarists, young and old, combine to create a full and lustrous sound. Nothing is more beautiful than a guitar, save perhaps two. – Fredric Chopin. With 18 guitarists, the dynamic and colour range available to this orchestra is a unique experience. Previous postThe Classical Guitar Practice Approach of A Very Busy Person! This is Not Goodbye, More Like Au Revoir…. Album Review: The Ben Verdery Guitar Project: On Vineyard Sound – a bold and adventurous offering, pushing the repertoire envelope! Guest Post from Daniel Nistico, The Resourceful Guitarist! Check out the last 4 or 5 years worth of posts here!